When buying meat, many of us choose to try and buy meat raised in our own countries and many supermarkets label their meat with a Union flag, or even the national emblem of Scotland, England or Wales. There are also quality marks awarded by meat industry bodies such as the English Beef and Lamb Executive and Quality Meat Scotland. These marks which appear as logos, guarantee that the meat, from birth to slaughter, process and packaging has remained in the country of origin and been produced to the standards set down by the governing body. However, not all meat is labelled in this way, and there are several reasons for this - as an example, 858,000 tonnes of pork products were imported into the UK during 2005. 70% of this processed pork couldn’t have been produced in the UK because the conditions under which the sows are raised, in stalls that prevent them ever turning round, are illegal here. However, because there is a loophole in the law, food can be labelled as UK produced if the last process carried out on it was carried out in the UK – so while the meat may have been raised abroad in conditions that would shock a British consumer, it is still labelled as UK produced if it was packaged in this country. Freedom Food is a label that appears on meat, eggs and dairy products. It means that the product has met the RSPCA's standards of animal welfare from birth to slaughter. It should be noted that these standards do not necessarily include the animal being able to free-range: chickens can be entirely barn-raised, for example, nor that the products are organic. Organic labelling means the meat has been raised and/or produced to tight standards that govern the use of pesticides and additives, a certain level of animal welfare and sustainability. There is more than one certifying body, with the Soil Association having the highest standards. Animal welfare is important but doesn’t necessarily require free-ranging and is species specific, so you need to visit the website of each labelling body, to find out what they lay down as the minimum requirement for each form of livestock. 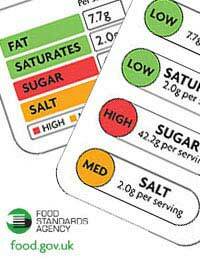 Traffic Light Labelling – has been designed by the Food Standards Agency – it is supposed to show consumers the levels of fat, sugar and salt in ready-made or processed foods. Some supermarkets and manufacturers have adopted the system on some of their foods, but others have introduced their own scheme giving calories, sugars, fats and salt as a percentage of the guideline daily allowance. Certain types of meat products such as burgers, sausages and meat pies must be labelled to contain, antioxidants, artificial sweeteners, colours, flavour enhancers, flavourings and preservatives. It is important to note that for meat products the label can state the category of additive as listed above, without specifying its full name or E number, so if you have allergies or reactions, you may find the label doesn’t contain all the information you require. Added water in quantities 5% or more in cooked cured meat (e.g. salami) and added water in quantities of 10% or more in uncooked cured meat (e.g. bacon). Finally, the label must contain a declaration that shows the percentage of meat in any meat product e.g. the amount of beef in a beefburger. Questionnaire: What Do You Know About Meat?